I don’t know if you saw the fun, time-lapse video we created last week (make sure you check it out, if you haven’t yet! ), but I wanted to be sure to share some more detailed STILL photos of the space and give an explanation of what was going on as we flew around in that video! I was so excited for us to do the space (so was Annette—she told me she could barely sleep the night before! :) ), and I thought it was the perfect opportunity to try out this new way of making videos!! 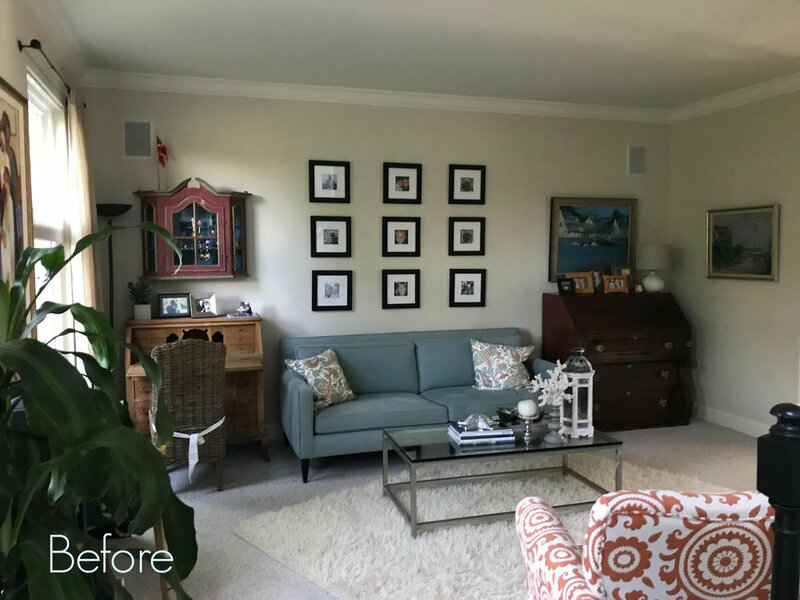 Annette has a degree in interior design, and has created a LOVELY home, but all of us need a fresh perspective on things from time to time (she has helped me many times in my own house when I am stuck!). 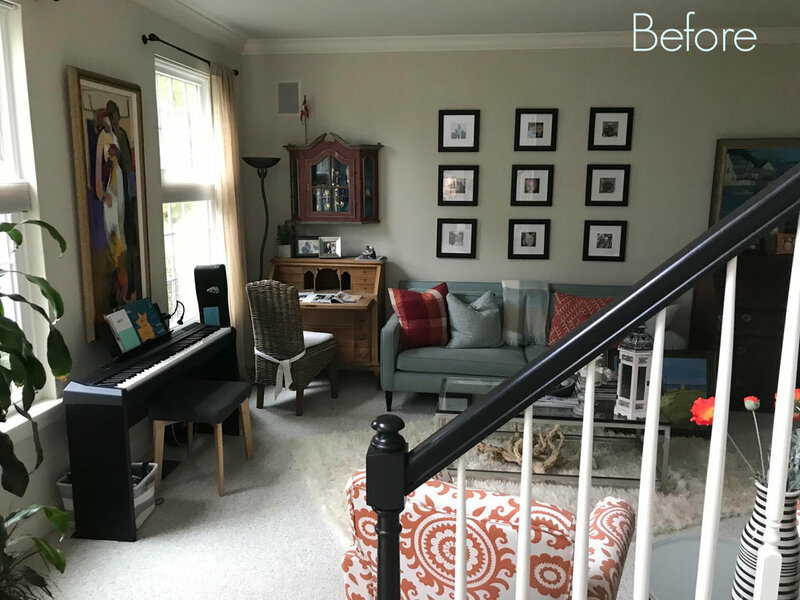 A new set of eyes on a room can pull things together in a completely different way—even with using most of WHAT IS ALREADY ON HAND IN THE SPACE. That is essentially what Redesign is—repurposing & rearranging much of what is already on hand in the space, and then adding a few, strategically selected and expertly chosen finishing touches. As is almost always the first step, we began by editing what was in the space and removing what was no longer working. The keyboard, which was rarely used, and older lamps were removed, as were some of the wall hangings, to make room for a cleaner, simpler room. 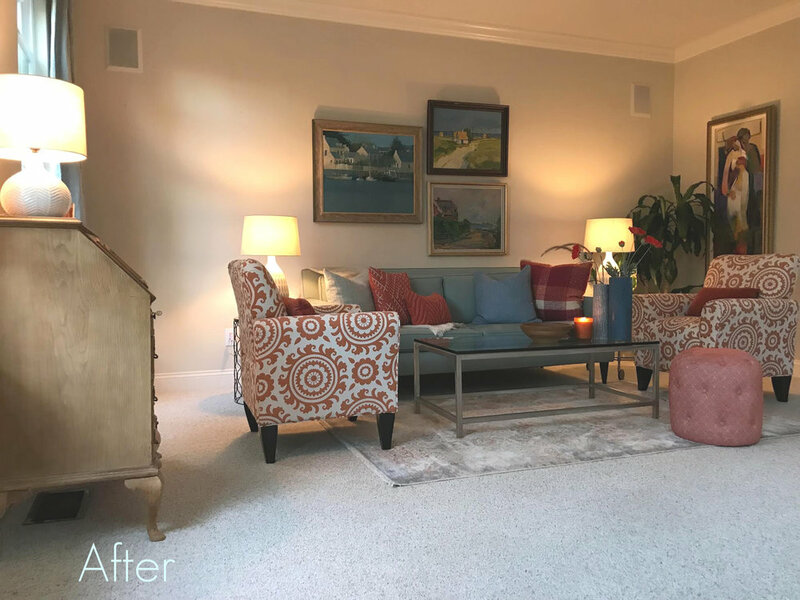 We added a fresh, more colorful area rug that had hints of orange and blue in it, and pulled all the seating pieces closer together to make for a more intimate conversation area. I wanted to make a bold statement and really pull out the orange that was in Annette’s side chairs, so new throw pillows (YAY!) as well as a candles, poppy stems, and a pouf all come together to make the color really POP! Annette had the most beautiful collection of seascape paintings that she has gathered over the years, and I wanted to make sure to highlight those as well by pulling them together into a striking grouping over the sofa (before they were spread out around the room, and they didn’t have as much of an impact). Grouped together, they make a statement and really set the tone for the room. The soothing blues in these paintings are a wonderful counterpoint to the electricity of the oranges, and I made sure we carried the blues into other accents in the room, such as the vases, picture frames, soft new blue curtains, & a mixture of shades of blue in the pillows on the sofa. DON’T FORGET—We are having a special on this SOULFUL REDESIGN IN A DAY which you can read more about here. IT ONLY GOES UNTIL NOVEMBER 30th, & we have a limited number of spots, so CLAIM YOURS TODAY by emailing us at hello@revealingredesign.com right away!! What can be done in a day?? A LOT!